Fencing can be used around the farm, home or garden for a variety of applications. Livestock are fenced in, deer and birds are fenced out, and some fences are installed simply for privacy reasons. The type of fencing used depends on your individual needs and budget. What types of electric fence does TekSupply offer? TekSupply has an extensive selection of electric fence options to keep your livestock, horses and small pets safely contained and protected from predators. Electric Netting: Electric Netting is a great fencing option because it can be easily relocated for rotational grazing. While the fence is composed of horizontal and vertical strands, only the horizontal strands are electrified. The bottom strand of the netting is not electrified to prevent grounding. This netting comes with all the components necessary to secure it to the ground, making it a complete, affordable system for sheep, poultry and small pets, as well as garden protection. Please note that Electric Netting should only be used with low impedance fence chargers. TekSupply offers a wide variety for all sizes and types of operations. Safe-Fence: The Safe-Fence System uses a white polytape filled with electrified strands to keep livestock safely contained, while creating an aesthetically pleasing look for your farm. Also, Safe-Fence is packed with UV inhibitors, preventing it from deteriorating in various climates. Safe-Fence is a great fencing option for horse paddocks because the breaking strength of the tape is less than the breaking strength of the horse's skin, allowing them to run through it before they can get hurt if they are spooked. With 15 strands of wire running through the tape, it is also the only polytape in the industry with a 20 year warranty. To complete your Safe-Fence system, TekSupply provides a huge selection of insulators, tensioners, wire and other accessories to help you design a customized system that fits your needs exactly. When setting up your Safe-Fence, it is recommended that you use four strands of polytape. This ensures that the spacing is small enough that horses or foals cannot get their heads far enough through to get spooked and potentially hurt. Premium Polywire: Polywire is not intended for use with horses, but is a great option for other livestock. 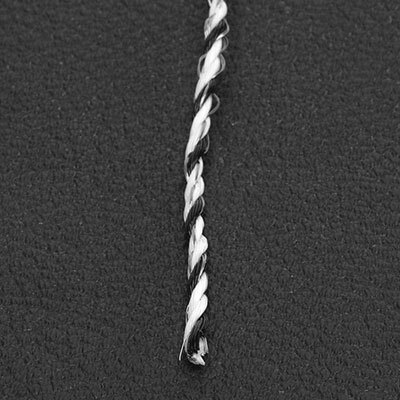 Due to its narrow dimensions, Polywire can be invisible to horses making an injury more likely. Polywire works well with existing strapping or fencing that would normally have to be replaced with electrified tape. If you are looking for a temporary electric fence, 6-wire polywire is an excellent choice especially for rotational grazing. Black and white 9-wire polywire is highly visible all year round, making it a safe option for your livestock. What types of fence chargers does TekSupply offer? TekSupply's line of fence chargers is made up of all low-impedance chargers that meet the guidelines of Underwriters Laboratory. The chargers are available in a large range of sizes and for a variety of applications. A few of the most unique and most popular are listed below. 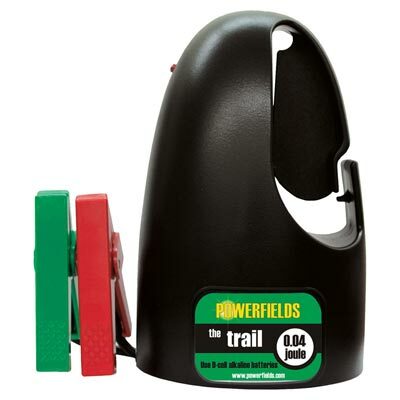 Trail (112226): Ideal for powering a small area exposed to the elements as this charger has a unique wind and rain-resistant case and built-in fence hook. 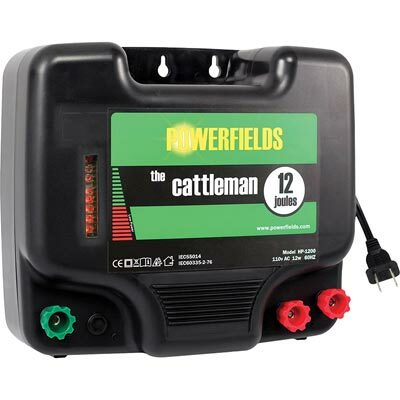 Cattleman (112225): Ideal for arid areas covering large spaces. This is a very powerful charger that does well in areas with low ground moisture. Nomad (112228) and Plainsman (112229): These chargers can be hooked up to solar power if used with a Solar Power Kit (108087), providing electric fence options that can be used even in areas with no power. More importantly, the built-in ground rods in both of these chargers make them completely portable, and ideal for rotational grazing. When setting up your fence charger, it is recommended that you place it as close to the fence as possible, and keep it out of the elements if you have the option. If there is no place for a fence charger to be under cover close to the fence, you can use Burial Wire (108068/108069) to span the distance between the charger and the fence. 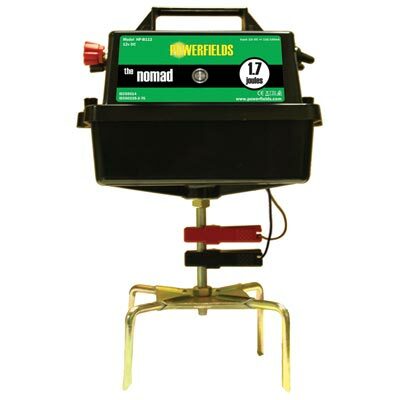 It is highly recommended that all fence chargers are used with a Ground Rod Kit (108092) which must be used in order to ground the system. Please note that without a ground rod to ground the system, all chargers will not work. What types of non-electric fencing does TekSupply offer? TekSupply offers non-electric fence made of many different materials for a variety of applications. Whether you are trying to keep livestock, birds or pets in, or keep pests and predators out, TekSupply will find you a fencing option to fit your individual needs. Any fence configuration is possible and most fencing and hardware can be discounted when purchasing in bulk. What types of bird fencing does TekSupply offer? Game Bird Netting: Rather than using wire mesh, this Game Bird Netting is made of high-density polyethylene fiber for a safe and flexible bird fencing option. This netting comes in light-knitted and heavy-knotted strengths to suit all needs and weather conditions. The light-knitted option is perfect for use with smaller birds such as quail and should be used in an area with little to no snow. The heavy-knotted material comes in 1" and 2" mesh. 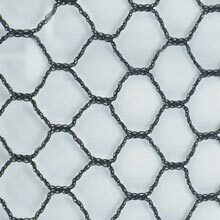 The 1" mesh is ideal for small birds such as quail in snowy regions. The 2" mesh should be used for larger birds such as pheasants in all regions. Though both materials are packed with UV inhibitors, the heavy-knotted netting offers slightly more UV protection, extending the life of the product. While offering the same look as steel mesh, this black netting is more cost-effective and quick and easy to install. Due to its Tightlock construction, Game Bird Netting will not unravel if you need to cut it. Galvanized Wire Mesh: This product works well as an anti-bird screen, as well as fencing for livestock and poultry. The large holes in the mesh pattern allow for more light, better air circulation and improved heating efficiency. If you are looking to fence in livestock and keep birds out, it is recommended that you use this 14-gauge wire mesh instead of polyethylene netting due to the strength of the material. Please note that when it comes to wire mesh, the lower the gauge, the thicker the wire. What deer fencing options are available? Keeping deer off your property greatly reduces the risk of Lyme disease, and is therefore highly recommended. When trying to keep deer out of an area, it is more important to install a fence that is difficult for them to see than it is to install one that is strong. Deer will attempt to enter your property by jumping over the top line of a fence. If you make it difficult for them to define that top line, they will not be able to jump over. 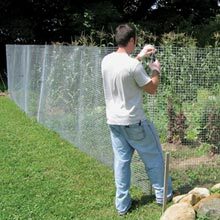 Deer Fence Poly Netting: This netting keeps deer and other wildlife out of your garden or orchard. 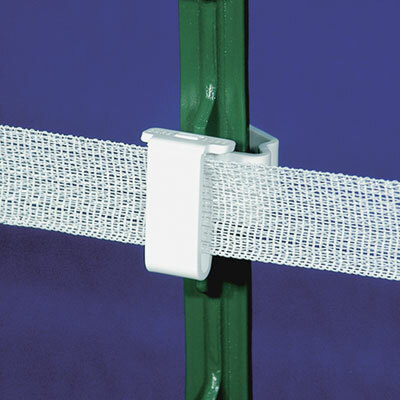 Poly Netting is lightweight, easy to install and UV protected for long life and durability. 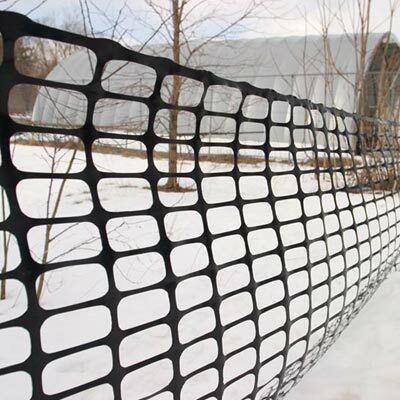 Manufactured from black plastic, Deer Fence Poly Netting can be paired with a variety of accessories for a cost-effective complete system. 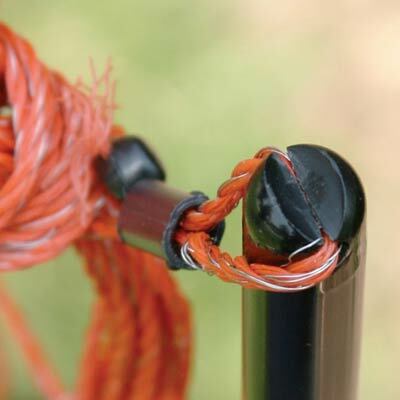 Some other accessories for the deer fence system include fence posts, corner post assemblies, flagging ribbon, cable ties, fabric clips and cable, all sold separately. Black Poly Geogrid: Geogrid fencing is not only a great option for deer fencing, but it also works well for keeping horses and small animals contained. 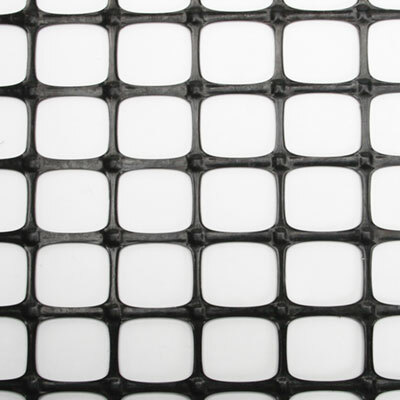 Manufactured from a unique, black, biaxially oriented polymer material, Black Poly Geogrid is UV resistant, lightweight, flexible and easy to handle, yet extremely durable. Does TekSupply offer fencing for any other applications? TekSupply carries both safety fence and snow and sand fence. 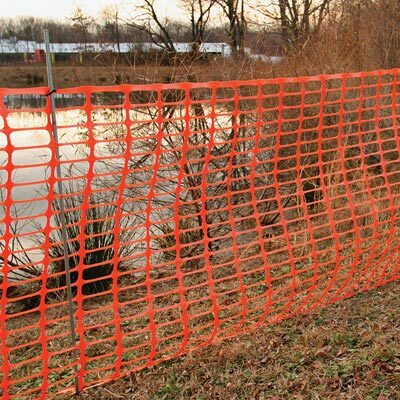 High Visibility Orange Safety Fence: This bright orange fencing provides excellent traffic control for work zones and hazardous areas. Made of UV-stabilized polyethylene, this fence is guaranteed to last in many outdoor areas. 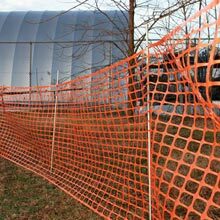 Orange Safety Fence is lightweight and easy to install, making it a perfect choice for temporary use at a construction site or for temporarily blocking traffic. Black Snow/Sand Fence: This durable black fence controls blowing and drifting to keep sand and snow out of open work areas. It is made of the same materials as the Orange Safety Fencing but is slightly heavier. If you are looking for a privacy or wind barrier, check out our Shade Material to see what material will work best for your needs. To create a complete fencing system, shop our Fencing Accessories. Have questions about Fencing? Visit our Live Help page or Contact Us.